Bishop Services, Inc. is comprised of an elite team committed to equip and manage your special events, natural disasters, military training maneuvers or facility remodels anywhere in the world. With a combined 35 years of experience this compliments us as one of the most effective companies in the industry today. We are a multi-functional service oriented company that is capable of providing multiple complete base camps. We have an outstanding history of service to the U.S.D.A. Forest Service. 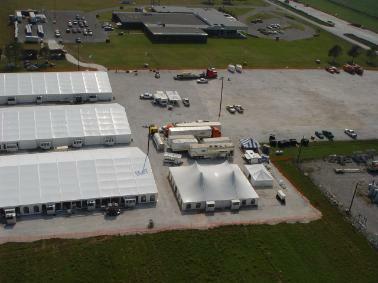 We provide the following services in many remote locations; logistical support, office trailers/command centers, mobile catering, refrigerated trailers, generators and lighting systems, tent cities, sleeper trailers, mobile laundry facilities, mobile shower units and portable sanitation. Of course, all of our units are self contained and fully mobile. With our experience in providing services to your industry, we are here to help assess your needs and provide you with the necessary equipment and staff to support your needs. Our company is ready for dispatch 24 hours a day 7 days a week.